Three-dimensional printing has become so common that devices are now being marketed that turn the process into an artistic game – but the BioPen is a far more serious gadget. The BioPen is more or less a handheld 3D printer that uses live cells – rather than extruded plastic – to fill in the site of an injury and speed healing. The cells are in a biopolymer like a seaweed extract, and an outer layer of gel protects the concoction. The surgeon slowly draws a scaffolding, curing it as it goes along with a low-powered UV light. The cells begin to multiply and differentiate themselves between bone, nerve, and muscle cells that will eventually get the patient back to normal. 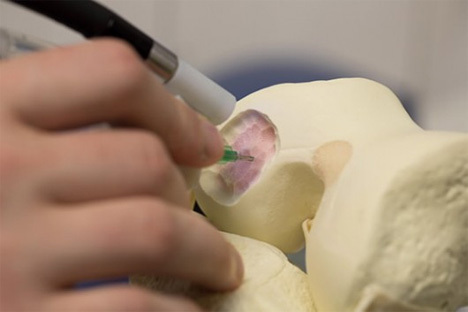 When the surgeon draws with the pen, he or she is basically inventing a completely custom implant right in the patient’s body with biological material. 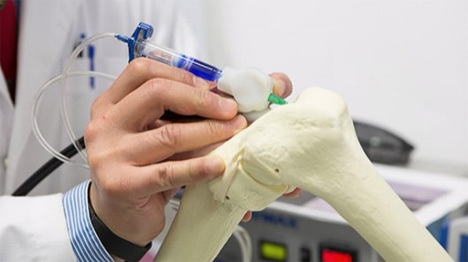 The BioPen, developed by researchers at Australia’s University of Wollongong, could be used to treat complex or catastrophic bone injuries. It can also help to regrow damaged cartilage and help treat certain types of cancers. See more in Medical Marvels or under Science. December, 2013.